Beautifully presented in a large basket, this gourmet gift will arrive at their doorstep with fresh fruits that may include pineapple, apples, oranges, bananas, or grapes. Along with the fruit will come a selection of gourmet items that may include nuts, sausages, cheeses, chocolate, or sweets. Your choice of wine completes the gift. Choose between high-quality Merlot, Chardonnay, or both. Each of these one-of-a-kind baskets is a prepared and delivered by an experienced local florist on your chosen day. Exact type of basket, fruit chosen and gourmet items will vary due to local availability and designer's preference. Photo shown is a representation only. Brands or specific items seen will vary with each unique basket. Your Choice of Wine: Chardonnay, Merlot, Two Chardonnay, Two Merlot, or One Bottle of Each. Gourmet Extravagance Fruit & Wine Basket is a hand delivered gift. These gifts are delivered by one of our local design centers located throughout the United States and Canada. Same day delivery is available for most gifts when ordered before the cutoff time. The cutoff time for Gourmet Extravagance Fruit & Wine Basket is 1 PM in the recipient's time zone. 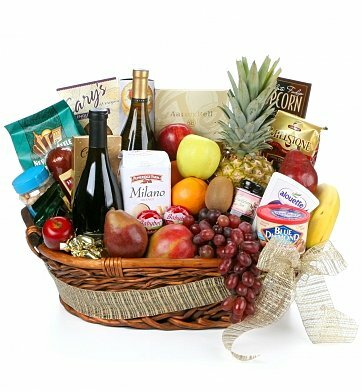 I ordered this "Gourmet Extravagance Fruit & Wine Basket" and as it's name states "EXTRAVAGANCE" that's exactly what the recipient got. The presentation was awesome and the quality spectacular. This basket and it's contents of fresh fruits, lots of goodies and wines brought nothing but some comfort to the bereaved person. I was so impressed that the same night I ordered another basket for my friend who lost her mom.